One Saturday night not too long ago, I was in the mood for something new. I'd had my full of everyone's latest rendition of the overly breaded crab cake with a side of vegetables and salad and I was on the prowl for something I'd never tried before. So I picked up Washingtonian Cheap Eats and started flipping through the pages looking for some inspiration. What's this Taste of Morroco in Silver Spring -- that's definitely new and I've never had Moroccan food before! Sounds like a good option. From my numerous trips to Ray's the Classics around the corner from Taste of Morocco, I knew that the parking situation is pretty good on the weekends. There are plenty of lots in downtown Silver Spring and traffic on the weekend is never too bad in that area. You'll forgive me if I don't go on and on about the decor at Taste of Morroco and how it makes me feel like I've been transported to another world, because I really couldn't give a crap, other than the fact that my son had a really good time bouncing on the cushions on the seat along the wall. Yeah, the decor is nice, but nice decor doesn't make up for bad food (I'm not saying that Taste of Morocco's food is bad, as you'll find out by reading the rest of this) no matter what continent you're "transported" to. One thing I really appreciated at Taste of Morocco was how helpful the people are at the restaurant. I think they realize that most people dining there have never eaten Moroccan food before, so they spend a lot of time explaining what the different types of dishes are. One thing they'll tell you, is that a tagine is "just anentree." You'll see sections for Chicken Tagines, Lamb Tagines, Vegetable Tagines. Oh and the Bastillas! When our server first explained the concept, I was like "BWAH?!" You're telling me me you're going to put powdered sugar on top of my chicken? But trust me, what might sound odd, is really very good. The bastillas are one of the more intriguing things I've eaten in a while. They're sort of like a Jamaican roti, but instead of a whole wheat roti bread on the outside, you get several layers of crispy phyllo dough topped with cinnamon and powdered sugar. I could order a large chicken bastilla as an entree and leave totally satisfied. Taste of Morocco happens to make these particularly well with a flaky crust and amazing flavor of the meat or vegetable filling. Since dining at Taste of Morocco, I've dined at some other Moroccan restaurants and been very disappointed. One place actually seemed to precook their bastillas and just serve you a reheated slice. Oy! Although I've stressed the bastillas, you shouldn't miss the other appetizers like harrira, a slightly spicy, tomato-based soup with chick peas, lentils, and various vegetables, or the Moroccan-spiced shredded eggplant, which has a nice smokey flavor. Your choices for entrees are pretty simple although it might look complex when first looking at the menu. Just start with the basic choice of couscous or tagine. I'm going to tell you right now that you don't want the couscous, unless you're someone who really likes couscous, because there's a LOT of couscous. I just found it boring. Regardless of this choice, the meats are cooked the same way in a clay tagine pot, which consists of a high dome at the top and maintains moisture in the pot while the meat is cooking. You choices of tagines start with Chicken, Lamb, or Vegetarian, and from there, you get your choice of seasoning. Both the lamb and chicken come out very tender because of the slow cooking method in the tagine pot, which infuses the flavor of the seasoning into the meat. My favorite so far is the chicken with preserved lemon and olive or the spicy chicken. I, and my vegetarian guests on another trip, found the vegetarian tagine to be ok, but a little boring, especially after following up a bastilla. Dollar-wise, the Moroccan feasts are definitely the way to go because they're a great deal. For around $50 two people get to sample each of the dishes I've described. You each get a choice of soup, an appetizer sampler of Moroccan-spiced eggplant, hummus, carrot salad, and cucumber salad, a small bastilla to share, a tagine, dessert of cookies, and a fruit basket. The only thing is that the fruit basket is lost on me and I feel bad leaving all that fruit just sitting there at the end of the meal. I mean, if I want an apple or banana, I'll go to my local farmer's market. The choice of wines and beers can be disappointing. The Moroccan beer on the menu is never available (in the Silver Spring location) because they can't get it imported into the state of Maryland, as is the same with the Moroccan wines. To get them, you'll have to go to Taste of Morocco's Arlington location, which personally I found to be a little better than the Silver Spring location. Everything we had there was basically a little better and cheaper as well. The feast itself was about $10 cheaper to start and the wines and beers are cheaper because it's in Virginia instead of Maryland. Parking: For Silver Spring, you have street parking and parking lots which are free on the weekends. In Arlington there is plenty of street parking and public lots. Closest Metro: Silver Spring and Clarendon. Reservations: Taken at both locations. Baby-Child friendly rating: 3 diapers. Plenty of high chairs and the staff is great with children. Amy's Bathroom Rating: They're acceptable. One of the few good things about working out in Largo is that I am close to a fabulous Jamaican/Caribbean eatery called Negril. Now, I know that Negril is no secret, at least to those of us that have lived in DC for more than a year, but I figured I would write about it anyway for the few people out there who haven't tried it yet. Negril has been doing what they do for more than 18 years now and have four locations around the beltway. As a family owned business, they control the recipes and quality of the food served quite well. Lunch is a must at Negril. If you're in a hurry, Negril might not be the place for you. The line can be kind of long and all of the food is made fresh to order. I've waited 20 minutes sometimes for my order, but it's definitely worth it. You wait in line, give your order and you'll get a number. The smart thing is to call ahead, and then pick up your order which you can then eat there or take back to the office. For a couple years now, I've been going to Negril for lunch and only ordering one thing, the jerk chicken sandwich. I know, that's extremely boring, but have you had the jerk chicken sandwich??!! Think of moist, tender, and spicy jerk chicken topped with a lemony poppyseed sauce and served on their warm, fluffy fresh-made coco bread. Why do they call it coco bread? I have no idea. It's surely not made with coconuts. The sandwich is fairly large, so it's enough by itself for lunch. However, I'll add one of the meat, vegetable, or chicken vegetable patties on the side. If your appetite isn't as large as mine, a quick lunch is one of these patties, with an order or coco bread. At $1.35 - $2.25 for the patty and $1 for the coco bread, it's about the cheapest lunch that I can think of around here. Just open up the coco bread by tearing it in half, put the patty in the middle, and close it. Voila! A Jamaican patty sandwich. Recently, I've branching out a bit and trying some of the other dishes at Negril. 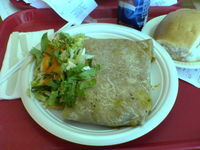 My current favorite is the chicken or goat roti. When I saw the word roti in the name of the dish, the first thing I thought of was an Indian whole wheat roti, and that's really what this is. Of course the roti is stuffed with a ton of tender shredded curried chicken, but for those of you who a scared of curry, don't let this scare you. It's NOT hot or overly spicy. The next dish I want to try is the curried oxtail. Negril is super cheap and you can get an incredible lunch for between $4 and $10 every time you go there. The portions are huge too, so you don't have to worry about needing a mid-afternoon snack. The only thing you do have to worry about is the afternoon food coma. This was the best damn dish I've eaten in a long time. I know it doesn't look like much from the pathetic photography (please ignore the shadow cast from my hand in in front of the flash) exhibited here, but it was delicious. Saturday afternoon, Amy and I went to Samantha's because Amy had a craving for some pupusas. Who was I to deny her? Instead of just blindly ordering something new off the menu, I asked our server what he recommended. He immediately pointed me to a dish on the specials menu -- tenderloin tips with rice, cilantro sauce, black beans and tomatoes. It sounded simple, but sometimes the simplest things on the menu end up tasting the best. Amy ordered 5 pupusas as well, which upon ordering, our server looked at us like we were nuts. "You want 5 pupusas?!" He had to double check, but I informed him that I intended to share them with Amy. In case you've never had pupusas at Samantha's, they're quite large. So back to the tenderloin tips. The smell of this dish when it was first brought to the table made my mouth water. Bright colors of green, red, and purple from the cilantro sauce, tomatoes and pickled red onions made the dish visibly appealing. The tender steak, grilled on a kabab with peppers, onions and mushrooms, is matched with cilantro and mole sauces, pickled red onions, tomatoes, and black beans giving a robust flavor that I've never quite tasted before. I'd practically finished the dish when Amy exclaimed, "You know for the past 10 minutes you've done nothing but moan over every bite of that dish! Are you planning on talking to me at all during this meal? Oh, and you told me you were going to share these pupusas with me." Read my other writing about Samantha's. Earlier this year, Mandalay moved from College Park to downtown Silver Spring. What was College Park's loss is Silver Spring's gain. At Mandalay, you'll find some of the best Burmese food in this area. That said, I don't know of any other Burmese restaurants in this area besides Mandalay. The closest place I know of is Straits of Malaya in Adams Morgan. This might surprise you, but before going to Mandalay, I actually did a little research about Burma, its cuisine, and history. If you look on a map, Burma (or what is now Myanmar) is located right between India, China and Thailand. This is an ethnic foodie's dream cuisine. Burma's cuisine is influenced by each country surrounding it - curries from Southern and Eastern India, noodles from China and Thailand (ok, that might be simplifying it a bit). Mandalay is actually a city in Central Burma. Blah, blah, blah. Enough with the geography lesson. Get on with it! Well, last Saturday night, Amy and I went to try Mandalay's new location in Silver Spring. When we drove up, the area was not quite what I expected. Bonifant St. is partly residential and partly commercial. Mandalay's façade makes it look like it is an everyday Chinese $7 buffet. On the inside, it doesn't look much different except there is no buffet. Of course for foodies, these things don't matter. It's all about the food. Right? We were sat quickly - there was no wait. The table next too us looked very satisfied with their meal. There were four people sitting there all of them talking about how they wanted to come back and rubbing their stomachs. Amy and I were enthused by the sight. Not that I needed to see that. Looking at Mandalay's menu online, I was very excited to eat there. The list of salads alone made my mouth water, nevermind entrees like WetThar MoteNyinChin Gyaw (Sliced pork sautéed with onion, sour mustard, and fresh cilantro) or KyetThar KyetHinGarThee Gyaw (Chicken sautéed with bitter melon and onion). It took a little while for someone to come over and acknowledge us, but that was the only service hiccup the whole meal. The servers were all very friendly and attentive. We were handed the menu, but I already knew what I was planning on ordering. I had planned to start with the Let Phet Thoke (green tealeaf salad) and have KyetThar PinSane/NanNanBin Hin (chicken chunks simmered in onion-tomato curry with basil or cilantro) as and entrée. (I'm not sure what's up with the "/" in the name on the menu. Does the dish have two different names? Guess I should have asked.) Amy took a while to decide what she wanted because she had not previewed the menu ahead of time. Her initial comment was that the menu was large but that most of the dishes were a variation on the same thing. She ended up having the BooThee gyaw (squash fritters) and Nyat KaukSwe Gyaw (flat rice noodles stir-fried with yellow beans, bean sprouts, romaine hearts, crushed peanuts, and lightly fried tofu). Before I tell you how the food was, I first should say that Mandalay has yet to acquire their liquor license. I kind of knew that this was a possibility before we went there, but I was hoping that they'd received it by the time I'd gotten around to visiting them. Oh well - like I need any more alcohol. Instead I had some hot tea because I've been coming down with something for the last week. The waiter brought me a teapot filled with fresh loose-leaf green tea. It was perfect for my sore throat. The appetizers didn't take long to come out. With tomatoes, toasted yellow peas, cashews, cabbage, fermented tea leaf, sesame seeds, puffed rice, and Burmese dressing, my green tealeaf salad had a pretty complex flavor to it,. The salad had an overall bitter flavor with a sweet aftertaste. Amy's squash fritters were lightly battered and served with a sauce on the side. The sauce tasted like a combination of soy sauce, sesame seeds and chili oil. Imagine the vegetable tempura that you would get at a Thai restaurant with a slightly thicker layer of breading. Cooked just right, the squash was not mushy and had a firm texture. We quickly finished our appetizers and our entrees came out soon after. When we ordered out entrees, the waiter asked us how hot we wanted them. Both Amy and I opted for a medium spiciness, but as it turned out, we both could have handled some more heat. When visiting at a new restaurant, you never know how that restaurant will define "spicy". My chicken in tomato-onion curry had a real hearty, comfort-food flavor to it. I don't think I could have had a more perfect dish for my looming cold. There was no dry overcooked chicken in this dish, although they use dark meat in the dish which almost always means you'll get a little gristle. With peanuts, wide rice noodles, yellow peas and fried tofu, Amy's entrée reminded her of a Thai dish. A bite of this dish started with an initial sweetness and ended with a touch of heat. We quickly finished off our entrees and we ready to move on to dessert. We had seen another table eating the ShweJi (Cream of wheat, coconut cream, sugar, raisins, and milk, topped with poppy seeds, then baked until light golden brown). According to Amy, it tasted "like a macaroon". It had a firm texture like a cake. Overall, this dessert was pretty good. Amy liked it a lot...probably more than I. At about $32, I would say this was probably one of the cheaper meals we've eaten in a long time. I would say the food was well worth it, despite the lack of atmosphere. Sometimes, though, you just want to go out for a casual meal and be able to get great food at the same time. It's probably too early to tell, but I'd say that Mandalay is just as good as Straits of Malaya, except it's considerably cheaper. Just quick, I wanted to tell everyone that last weekend I went back to Samantha's again and it was even better than the first time I went there. This time, I started with some pupusas and finished with a chicken chimichanga that was probably one of the best I've ever had. The chicken was very tender and fresh. Unlike most other Mexican restaurants, the chimichanga was not deep fried. Instead it was pan fried which I think is one of the reasons it tasted so much better. The Spanish rice it came with was moist and flavorful. I think what made the dish was the refried beans, though. Oh, and the pupusas were excellent. I LOVE their pork pupusas. I ordered a margarita, and it was not as good as the one I remember ordering last time. I think it was made with a mix - you could definitely tell the difference. So for my second drink, I ordered a "Cadillac" margarita which ended up being a lot bigger and a lot better. Service was excellent as well, but we had the same waitress as last time. :) If you guys haven't been to Samantha's, you should go! First, let me give credit where credit is due. I would not have gone to Samantha's if it were not for two things - Amy suggesting we eat there after reading Tom Seitsema's chat and my reading Tom Sietsema's Fall Dining Guide. If you follow this link, you will see that I even posted to Tom's chat last week and thanked him personally, cause I really loved Samantha's. Can you guess which post was mine?? Samanatha's is located on a small building by the intersection of University Blvd. and Piney Branch Rd. in Silver Spring. We drove over there for lunch a couple of weekends ago because I had a serious craving for some pupusas. The restaurant looks pretty nice on the inside, which you probably wouldn't normally expect from the look of it on the outside. Staff are all in uniform and wearing ties. I imagine the small dining room get's pretty crowded, but that Saturday afternoon, it wasn't even half full. If Samantha's was in Dupont Circle, there would be a constant line out the door. I have to admit though, Amy and I didn't exactly brank out and try a lot of different food at Samantha's. Mostly we just ordered pupusas. They are $1.50 each, which is an extreme bargain and they're a lot larger than other pupusas I've had. We also ordered the queso fundido to start with. It was not your ordinary queso made of Velveeta and onions. It was actually made of real cheese and peppers, which is nice. Sometimes, though, you just want Velveeta and onions. :) We ordered a couple of each kind of pupusa - chicken, pork, queso, and beef. To say the least, it was more than either Amy or I could eat. I barely finished three. I'm looking forward to going back to Samantha's and trying their other dishes. They had your typical Tex-Mex dishes like you'll find at Rio Grande Cafe and those types of places. I have this feeling though, they will put those places to shame. I especilly want to try their chimichanga.